A new highway design standard has saved the Idaho Transportation Department nearly five times more money than initially expected. Adoption of the Practical Design management approach initially was expected to produce savings of about $5.6 million in 2008.Here are the details from the ITD website. We've been hearing rumblings from the community recently about flaggers stationed at intersections on US 95 to help pedestrians through the maze of construction. Apparently some people think it is a waste of taxpayer money. I checked with Idaho Transportation Department's Public Involvement Coordinator, Barbara Babic, who said this is a unique solution to a big challenge. During construction projects on busy roads in the past, ITD received serious complaints about ADA compliance. Pedestrians, and particularly people with handicaps, were having a hard time negotiating ramps and accessing the buttons that provide the 'walk' signal. The project on 95 is a large inlay/overlay project that traverses many intersections. Design and construction engineers worked hard to come up with a solution to accommodate pedestrians and comply with ADA during construction. But building temporary ramps, detours, and re-aligning ped buttons was unrealistic from a schedule and cost perspective. Early estimates just to install the temporary accommodations were over $320,000. Instead, ITD decided to use flaggers at the intersections to assist people across the road. Nine intersections are being flagged during the day for 5 weeks. This solution cost less than half of installing temporary accomodations, at $135,000. At this time, ITD doesn't have numbers for how many people have used the flaggers but say it's a significant number, with a mall and school in the area. Several of those assists have been to help people in wheelchairs cross the road. Thank you to Parker Toyota and Camy Popiel of Horace Mann Insurance. The two are teaming up to give hundreds of brand new bicycles and helmets to Kootenai County elementary school graduates with perfect attendance this past year. More than 200 students at 23 elementary schools will receive a new bicycle on the last day of school. A letter to the editor in today's Coeur d'Alene Press says bicyclists are creating more of a danger than drunk drivers! The letter writer cites several infractions he has seen bike riders commit recently that have caused danger situations for other people on the road. Here's the letter. Take a look and tell me if you have noticed that bicyclists are this bad in north Idaho, or is it just a couple of bad apples? 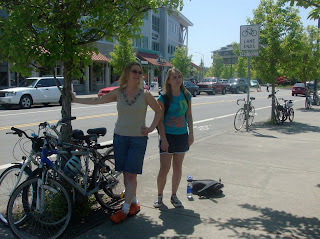 I had plans to visit my friend Holly (seen here with her daughter Sarah who looks as bored as is required of a teenager) this weekend in Olympia, and when she suggested I bring my bike, I had no idea what I was in for. Sure glad I did because we spent all weekend riding the many bike trails in the area. In this picture, we had ridden to the farmer's market downtown and there were so many bikes we had to lock ours to trees as all the bike racks were full. I was impressed with how pretty much every street (besides the ones through purely residential areas) had bike lanes on both sides of the streets. We rode all kinds of places that I would be nervous to go on a bike in our area. 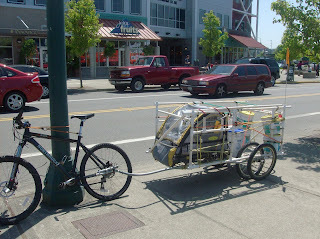 And not only were a lot of other people riding also, but they were coming up with some pretty creative ways to utilize their bikes, such as this trailer made of PVC. The walkability was also impressive. When we got the itch to take in the nightlife Saturday night, we walked downtown. At 10:30 at night! And it wasn't considered weird, as everything is close together and centered around the downtown area. So close in fact, that most the area kids ride everywhere. We kept bumping into Holly's kids all over town, and when I would ask how they had gotten there, they would say they had ridden their bikes. And she hadn't even had to nag them to go outside and quit playing video games. 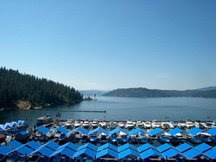 If this beautiful weather has you itching to get on your bike and ride, you may want to hit the Trail of the Coeur d'Alene's. And before you do, you may want to check out the new Facebook page devoted to it. The 'Trail of the Coeur d'Alenes Riders' group is for people who use the trail so that they can post comments about their trail riding experience on Facebook. Or, people who plan to use the trail can check out the page to see what they're in for before heading out for a ride. Estar Holmes of Harrison, ID created the page to provide a space for useful feedback for potential visitors, trailside businesses, tour groups, etc. Anyone is welcome to join so check it out here. A reminder that if you're not doing anything this morning and want to get out, a groundbreaking ceremony is scheduled for 10:00 a.m., at the corner of 4th Street and Foster Avenue, for the 4th Street Reconstruction Project. The project is a major revitalization effort, including enhancement of the midtown area. There will be three phases to the 4th Street Improvement Project. This first phase will begin at Foster Avenue and end at Miller Avenue. The second phase, starting in late June, will begin at the alley north of Lakeside Avenue and proceed north to Foster Avenue. The final phase starts in mid to late July, beginning from Miller Avenue north to Harrison Avenue. Construction is expected to be complete in early October. The 4th Street Improvement Project will begin Tuesday, May 26th. It is a major revitalization effort, including enhancement of the midtown area. There will be three phases to the 4th Street Improvement Project. This first phase will begin at Foster Avenue and end at Miller Avenue. The second phase, starting in late June, will begin at the alley north of Lakeside Avenue and proceed north to Foster Avenue. The final phase starts in mid to late July, beginning from Miller Avenue north to Harrison Avenue. There will be one-lane, through traffic, throughout most of the project phases. Temporary closures, with detours to side streets, will occur when stormwater mains, water service lines, or accented intersections are being installed, or paving is taking place. GOVERNMENT OFFICES WILL BE CLOSED ON MONDAY, MAY 25. This includes City Halls, and all other government offices, except the indispensible stuff like police, fire, etc. So have a good weekend but don't plan to get any building permits before Tuesday or do any other government business. Gas prices are going up again in advance of the holiday weekend, and that has some people a little irritated. Here's what you have to look forward to at the pumps this weekend, from the Coeur d'Alene Press. It won't be open for the holiday weekend but the Route of the Hiawatha trail is scheduled to open for the season on May 30. Lingering snow patches on the trail is causing it to open later than planned. 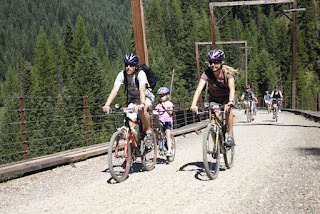 The 15-mile bike route follows the old Milwaukee Railroad grade along the Montana-Idaho border near Lookout Pass. For more Information, call (208) 744-1301 or visit www.ridethehiawatha.com. A new website-RentaBikeNow.com- has just launched North America's only coast-to-coast bike rental service that provides bikes, accessories and tours so travelers can easily ride bikes everywhere! Through this service, millions of cyclists across the globe can easily reserve quality bikes online from hundreds of participating bike shops before they travel throughout the US and Canada. By simply selecting a destination, travel dates and type of bike, travelers can search among available bikes and reserve the specific model that suits their size and riding style. Bikes are presented with specs, photos, pricing and shop hours to help travelers find the perfect bike and most convenient bike shop. Has anyone tried a service like this before? What do you think? Congratulations Idaho! According to a new GMAC Insurance poll, you have some of the best drivers on the road. Idaho tied with Wisconsin for best in the nation in driving knowledge - meaning performance on the written test for a driver’s license. Idaho drivers’ average score was 80.6%; just 5.7% of Idaho respondents failed, scoring under 70 percent. Here's more from the GMAC website. A three-year decline in Memorial Day travel is expected to reverse itself this weekend with a small increase in the number of Americans hitting the road, rails or skies. Here's what AAA is predicting for this holiday weekend. Gas Pump Fights Back- Has This Happened To Anyone Else? So luckily this happened at the end of the day yesterday instead of the beginning, because I probably would have gone home to change my clothes and gone back to bed. On my way home, I stopped at my neighborhood convenience store to get gas. I stuck the nozzle into the gas tank and pushed the trigger. I don't know if it was the force from the flowing gas or what, but the entire hose POPPED OFF THE GAS PUMP, dousing me in gas! So I've got one end of the hose stuck in my car and the other lying on the ground and I'm covered in gas. And the manager at the store was not very apologetic when I stormed in to complain. She simply said to move to another pump, and that the 37 cents worth of gas that sprayed all over me would show up on my debit card. After some angry words, she agreed to have my clothes cleaned if I brought them back in later. It was a long, smelly drive home. I should have taken their %$#@ hose with me. Senate Democrats have submitted legislation that suggests the nation's transportation policy is headed for a major overhaul, with a strong emphasis on reducing automobile use and boosting public transit. Sen. John D. Rockefeller IV (D-W.Va.), chairman of the Commerce, Science and Transportation Committee, and Sen. Frank Lautenberg (D-N.J.) introduced legislation that they say lays out the guidelines of what they expect the next five-year federal transportation spending plan to accomplish. Here's more from the Washington Post. Bids for seven of Idaho’s eight stimulus-money roadway projects went out for bid in early May, with the eighth scheduled to be advertised in mid-June. According to this article in the Idaho Business Review, that puts the state ahead of 48 other states in securing federal transportation stimulus funding. Garwood Road, east of U.S. 95, will be closed tomorrow (May 19) at 6:30 a.m. to prepare for switching traffic to the new highway alignment for the U.S. 95/Idaho 53 to Ohio Match Road project. It will remain closed until Friday afternoon, May 22. U.S. 95 traffic is scheduled to be switched to the new alignment after 6:30 p.m. Tuesday evening. Access onto the highway from businesses and residences located on the east side of U.S. 95 will be restricted until Wednesday morning (May 20). Garwood Road west of U.S. 95 will re-open immediately after traffic has been moved. The closure is necessary to accommodate the construction of the southbound lanes on U.S. 95 at the intersection. The project will widen and realign U.S. 95 from Idaho 53 to Ohio Match Road. The contractor for this $13 million project is Central Washington Asphalt, of Moses Lake, Wash. The project is expected to be complete by September. One last reminder that you're invited to join KMPO at a community workshop tomorrow (Tuesday) night to consider existing bike and pedestrian conditions in support of a region-wide non-motorized transportation plan. The workshop is open to anyone who uses, or would like to use, non-motorized transportation in Kootenai County. It's from 6-8 p.m. at Q'emiln Park (12201 W. Parkway Dr., Post Falls, ID) in the Trailhead Pavilion. Here's more on the Non-Motorized Plan. An editorial in the Idaho Statesman proposes a fix for the Idaho Legislature's refusal to raise taxes to meet the state's road maintenance shortfall. Writer Rocky Barker suggests reducing the size of the state's road system. Sounds crazy but it's happening more and more. Read the story then give us your opinion. Idaho Law Enforcement agencies are watching for you this week and next if you don't wear a seat belt. From May 18 through the 31st, more than 50 Idaho law enforcement agencies will be strictly enforcing the state's seat belt law. Last year, 105 unrestrained people were killed in Idaho traffic crashes. Fines for violating Idaho's safety restraint laws range from $10 to $69. Decisions to not buckle up also cost Idahoans money. U.S. Department of Transportation studies show that seat belt use in Idaho saved $268 million in comprehensive costs in 2007 alone. However, the lack of seat belt use by approximately one in four Idahoans cost citizens of the state nearly $48 million in preventable emergency, medical and social costs. And don't forget the huge cost to your family if something happens to you. So quit making excuses and buckle up already. With the summer street patching repair season approaching, Coeur d'Alene Street Maintenance Department crews will focus on the patching of major streets that are in the poorest condition. Here's the list of streets that will initially be focused on from the city of Coeur d'Alene today blog. I always like my job, but days like yesterday I absolutely LOVE it. Because I got to ride my bike on work time. Before you start complaining about your tax dollars paying for me to have fun, I was actually working. After that, we rode around to distribute flyers for our upcoming Non-Motorized Plan workshop next week. And the way we figured it, not only were we saving taxpayers the rates of 56 cents per mile we usually receive when driving, it probably took us less time to distribute them by bike because we didn't have to drive around looking for parking places. Here's your one week warning; KMPO will host a workshop next Tuesday to gather public input on the development of a region-wide Non-Motorized Plan. 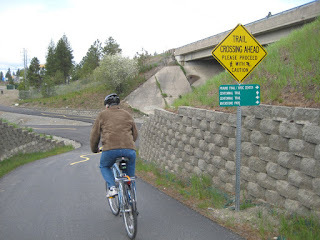 We're looking for help identifying what key bike and pedestrian connections are missing in Kootenai County, what kind of connections are the highest priority, and what kind of education programs are most needed. Here's a link to the KMPO website for more information on the plan. The workshop will be from 6-8 p.m. next Tuesday, May 19 at the Trailhead Pavilion, Q'emiln Park in Post Falls. To help us plan, please RSVP if you are interested in attending. You can either call 1-800-698-1927 or email to RSVP. The City of Coeur d'Alene will install those seven benches in June, most likely. If you're interested in sponsoring a bench, you can call Craig Wilcox for more information at (208) 818-2256. A day devoted to cleaning up and repairing Canfield Mountain biking and hiking trails was a big success, with over 60 people showing up in the morning for the volunteer work and more expected in the afternoon. Here's the story from the Coeur d'Alene Press. Idaho drivers have four more special license plates to choose from. Gov. Butch Otter signed a bill into law today creating four new license plates, including one for families who’ve lost a member in combat, one for Idaho Freemasons or Shriners, one backing education for youngsters about earth science and lapidary (cutting gem stones- what the heck? ), and one to recognize commercial innovation. 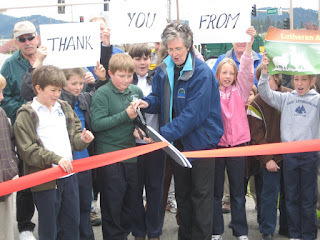 Come to the Mountain West Bank parking lot at the corner of Ramsey and Kathleen at noon tomorrow, May 12th, to celebrate the ribbon cutting of the Kathleen Connector path. Why is it important? After the Prairie Trail was paved, the North Idaho Centennial Trail Foundation noticed that for a distance of .25 miles between Ramsey and the Prairie Trail, there was no trail or sidewalk along Kathleen. It was a critical gap that was used by many kids going to and from Woodlands Middle School, Holy Family School, Ramsey Elementary School, and even the Charter Academy. The North Idaho Centennial Trail Foundation put together a partnership of people and agencies to get the gap paved. The city provided the right-of-way. The Engineering Department provided engineering support. The Streets Department did the prep and paving work. The Parks Department provided approximately $3,500, signs, and supervision. The NICTF provided $2,500 and solicited other contributions. Greenstone Corporation contributed $2,500. Mountain West Bank contributed $500. Poe Asphalt discounted the cost of the asphalt for a savings of $863. MDM Construction donated the crushed-rock base material, which was worth approximately $1,000. Due to the generous contributions, the total price of construction was approximately 50% of the cost of a similar project. The Idaho Senate passed a bill this week moving US 95 steps closer to getting federal funding for improvements. If signed by the governor, the bill will widen US 95 to four lanes between Wyoming Ave. and Highway 53, avoiding a major bottleneck situation. Here's the story from the Coeur d'Alene Press. Idaho lawmakers finally reached a tentative transportation funding deal yesterday afternoon but it won't raise the state’s gas tax, as Gov. Otter had demanded, and it leaves funding sources uncertain for the state’s annual shortfall in road maintenance. Overall, the plan would raise an additional $54 million a year for roadwork, starting in fiscal year 2011. Here's more on the plan. I'll be out of town tomorrow so I'm trying to get all my 'week ahead' blogging done today. So, this is your last reminder about Bike To Work Week before it starts on Sunday. Cyclists are being encouraged to ride every day of Bike to Work Week. There will be energizer stations located at nearly all bike shops in Coeur d'Alene, Hayden, and Post Falls. There will be two stations that will have representatives from area bike shops who will do free bike checks for anyone on a bike. One will be located at the Prairie Trail/Centennial Trail intersection and the other will be on the Centennial Trail in front of Mt. View Cyclery in Post Falls. They will be there Monday through Friday, May 11-16, 7:00 – 9:00 a.m. and 4:00 – 6:00 p.m. Free Gatorade, water, and snacks will be offered. Enough said, now get on your bikes and ride! Garwood Road west of U.S. 95 will be re-opened for the weekend, beginning tonight (May 7) at 5 p.m. The road will remain open until 6 a.m. Monday, May 11. It will then close again until 5 p.m. on Friday. The closure is necessary to accommodate the construction of the southbound lanes on US 95 at the intersection. Alternate detour routes are in place. The project will widen and realign US 95 from SH 53 to Ohio Match Road. The project is expected to be complete by September. Besides the rural route, all other Citylink routes have continued to grow in the past year... significantly! Here's a look at the latest ridership numbers. You're invited to take part in Canfield Mountain Trail Building Day this Saturday, May 9. Join City of Coeur d'Alene staff and other volunteers at Shadduck Lane Park at 8:30 a.m. to help construct a 1.2 mile hiking trail on the city owned portion of Canfield Mountain. For the last two summers, Boy Scouts have been clearing brush and digging trail to help provide the community with a natural hiking and biking trail at Canfield Mountain. The plan on Saturday is to finish the trail. 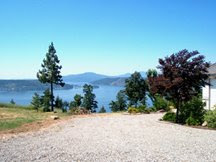 Shadduck Park is located on Shadduck Lane, which is a continuation of Kathleen and Margaret Avenue in the North East corner of Coeur d’Alene. Please bring a tool: Pulaski, shovel, rake or pick, if you have extras please bring those too! Don’t forget to wear jeans, boots, gloves, and eye protection. For more information, contact Monte McCully at (208) 292-5766. Garwood Road west of U.S. 95 will be closed beginning tonight (May 5) at 5 p.m. The closure will be in effect until Friday (May 8) at 5 p.m. It's necessary to accommodate the construction of the southbound lanes on U.S. 95 at the intersection. Detour routes are in place. The project will widen and realign U.S. 95 from S.H. 53 to Ohio Match Road. The project is expected to be complete by September. Bike To Work Week Lineup- Get Registered Folks! Bike to Work Week starts this Sunday- less than a week away! So you're running out of time to get over to the BTW website and sign up for the corporate challenge. 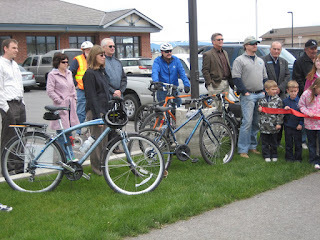 - Engergizer stations will be located at nearly all bike shops in Coeur d'Alene, Hayden and Post Falls. There will be two stations that will do free bike checks. One is located at the Prairie Trail/Centennial Trail intersection and the other on the Centennial Trail in front of Mt. View Cyclery in Post Falls. 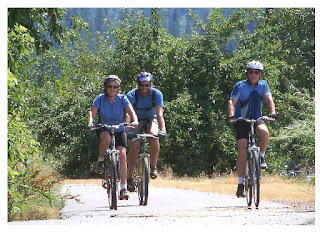 - BTWW kick off rides in Coeur d'Alene, Hayden and Post Falls. Coeur d'Alene's ride starts at 7:30am at Riverstone Park. Hayden's ride starts at 7:30am at Cafe Maria and end up at Hayden City Hall Park. 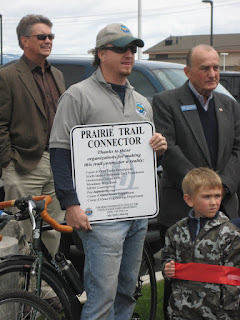 - Ribbon cutting ceremony at noon at the Mountain West Bank on Kathleen Avenue in Coeur d'Alene for the Prairie Trail. - Bicycle fashion show at 5:30pm in Coeur d'Alene's City Park in the Band Shell. - Free commuter clinic at 5:30pm at Terra Sports on Sherman Avenue in Coeur d'Alene. - The "Finish Line" celebration will be held in Coeur d'Alene's Sherman Park at 5:30pm. There will be raffles and trophies for BTWW participants. - Bicycle Safety Clinic and Rodeo at the Kootenai Medical Center Health Fair. For more info on BTWW, click here. There's no end in sight for Idaho's legislative session. Yesterday, the 113th day of session, senators killed more than a dozen House bills, Gov. Butch Otter appealed for compromise, and House GOP leaders continued to back Otter's call for a gas tax increase to fund road maintenance. Why do I hear the circus theme music in my head every time I read an update on the session? Here's the latest. The final draft of the SH 97 Corridor Study/Route Development Plan, developed by KMPO, is complete and open for public comment. The comment period starts 5/1/09 and all comments must be received before 6/1/09 by emailing to kmpo@kmpo.net, mailing to KMPO, 221 W. First Ave., Suite 310, Spokane, WA 99201, or calling 1-800-698-1927. Here's a link to the document. Congrats Citylink On Federal Award! 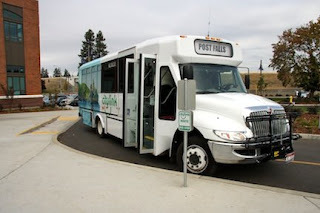 The Citylink Bus System, a vibrant and thriving transportation service for Idaho’s Kootenai and Benewah counties, is in massive demand from riders on every route. That demand and its growth over time are now bringing national recognition. The Federal Transit Administration will honor Citylink in Seattle on Monday, May 4th with its national award for ridership gains and innovation to boost ridership. The award comes as a significant milestone for Citylink, which began full operations in November, 2006. But Citylink is already unique in its conception, the brainchild of efforts by the Kootenai County Commission and the Coeur d’Alene Tribal Council. Citylink remains the first and only transit system in the United States to come about as a result of cooperative effort between local and tribal governments. In its first year of operation, Citylink averaged about 4,000 riders per month. It now averages some 35,000 per month, with annual ridership exceeding 500,000. It serves Coeur d’Alene, Post Falls and Hayden in the northern loop; the southern loop serves Worley, Plummer, Tensed and DeSmet. The rides are free. Buses are equipped to carry bicycles and wheelchairs. Planned to bring people to medical facilities, businesses, schools, public buildings and even recreational facilities, Citylink operates almost 24/7. The tribe provided $1.1 million in matching funds for an FTA grant to Kootenai County and the Kootenai Metropolitan Transit Authority. The KMPO is made up of elected officials from the county, cities and highway districts. The awards ceremony will be held on Monday, May 4, 2009, from 2:15 p.m. to 3:45 p.m. during the American Public Transportation Association (APTA) Bus and Paratransit Conference at the Sheraton Hotel, 1400 Sixth Avenue in Seattle, Washington.